Embark on a journey along sections of the Canal du Midi aboard the enchanting hotel barge, Anjodi, famous for taking Rick Stein on his 400 mile French food exploration in the TV series Rick Stein's French Odyssey. As well as indulging in the fabulous cuisine of the region you'll meander through the fabled Cathar Country, cruise past flamingos in the Bagnas nature reserve and visit the fascinating medieval walled city of Carcassonne with its fortress, alleys and shops. All cruises are fully inclusive of six nights accommodation, gourmet meals, fine wines and open bar, daily excursions, local transfers and full use of all onboard amenities. On alternate weeks the cruise is operated in the reverse direction. You’ll be met at the designated meeting point and taken to your hotel Barge, Anjodi, in the fishing village of Marseillan, home of Noilly Prat vermouth. Whilst enjoying the view across the oyster beds, you’ll receive a Champagne welcome aboard and you’ll have time to settle in to your cabin or take a stroll around the village before dinner on board. Hotel barge Anjodi is a classic Dutch designed boat that has been specifically rebuilt to navigate the 330 year old Canal du Midi. She has been traditionally refurbished in rich African hardwoods, shining brass and hand-crafted panelling to recreate the classic yacht feel which is extremely comfortable and very charming. The well designed accommodation offers four air-conditioned staterooms, all with en suite facilities. The upper sundeck, with plenty of shade is very spacious with sunloungers and a sunken spa pool. Anjodi was the barge that carried chef Rick Stein on his 400 mile trip through the French countryside in search of the many culinary delights of the Canal des Deux Mers region of southwest France. After breakfast, we cruise to Portiragnes through the tranquil nature reserve of Bagnas with the possibility of spotting flamingos as well as other wildfowl. We have lunch on board followed by a visit to Pezenas, the enchanting 14th century capital of Languedoc which is known for its association with French playwright, Molière, who is said to have written many plays while staying in the town. We have dinner on board. Today, we cruise further along the Canal du Midi to Beziers where you’ll have plenty of opportunities to walk or cycle along the towpaths. After lunch we take a winery tour and tasting at the 14th century Château de Perdiguier which is famed for its beautiful frescos and fabulous Cabernet Sauvignon, Pinot Noir and Chardonnay wines. Dinner on board. This morning, we venture to Narbonne, a Roman Mediterranean capital where the Visigoth monarchs once lived. We explore the Archbishop’s Palace, Cathedral and Via Domitia along with the indoor market in the middle of the bustling town giving you the opportunity to indulge in some retail therapy. On our return to the barge, we have some lunch and cruise along the aqueduct over the River Orb which leads us to the 7-lock flight at Fonserannes where we moor for the night. Dinner is ashore tonight in a local restaurant. Today, we continue our cruise to Capestang, passing through the world’s oldest canal tunnel at Malpas. Again you’ll have the chance to walk or cycle beside the canal as we cruise.After lunch, we visit Minerve, the ancient capital of MInervois. Take in the spectacular views from the 12th century Cathar fort on the hilltop which is surrounded by deep limestone gorges. A tour of the small museum along with a miniature recreation of the bloodthirsty Cathar rebellion depict the history of this stunning location. Dinner on board. 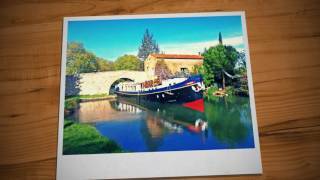 On our last day of crusing on the Canal du Midi we visit the village of Le Somail. After lunch, we visit Carcassonne which dates back to Gallo Roman times and is the most complete medieval fortified city in existence. It resisted many armies invading due to its 52 watch towers, the portcullis and an extraordinary array of defences. Tonight, the Captain hosts a farewell dinner on board. After breakfast, guests disembark and are transferred to the designated drop off point in Montpelier.